These are the children (and their spouses) of Carmelo and Pietra Quagliata, and their grandchildren. 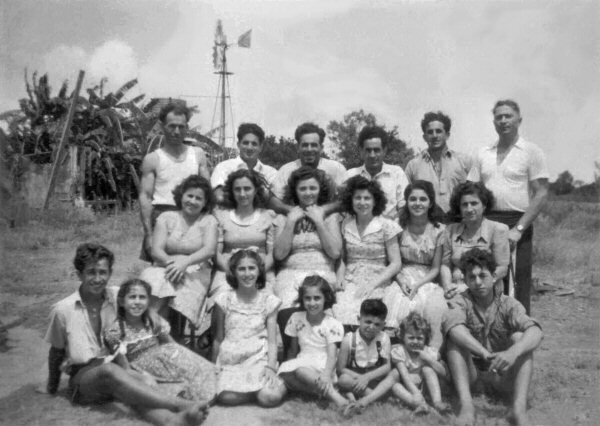 The men are lined up behind their wives; grandchildren are in the bottom row. The photo was taken at the end of 1949 in Ayr North Queensland. Click the photo for a full size view. Thanks to Mary Trovato (wed to Leonardo Carmelo (Charlie) Trovato, bottom left) for this great photo. Giuseppe (Joe) Quagliata (Carmelo's son), Giovanni Mangano (wed Caremlo's daughter Alfina). Sebastina (Annie) Quagliata (wed Carmelo's son Giuseppe), Alfia Mangano (Carmelo's daughter wed Giovanni Mangano). Rosario (Ross) Trovato (Concetto & Antonina's son).